That provocative line comes courtesy of Bono, who has worked with famed Dutch visualist Anton Corbijn numerous times over the years and is featured prominently in Shadow Play: The Making Of Anton Corbijn. Aside from providing some voiceovers, the U2 vocalist also gives several interviews and is featured in a clever riff on Bob Dylan’s “Subterranean Homesick Blues” video. The documentary flips the camera around 180 degrees to present a portrait of the photographer/film director/music video director and his work, motivation, inspiration, and background. Director Josh Whiteman has assembled an impressive roster of celebrities to sing Corbijn’s praises – along with Bono, we also get testimonials from Michael Stipe, Kurt Cobain, Dave Gahan (Depeche Mode), Brandon Flowers (The Killers), Chris Martin (Coldplay), writer William Gibson, actress Samantha Morton, and model Helena Christensen. These names represent only a fraction of the talent Corbijn has collaborated with over his career, though. Others include Bruce Springsteen, David Bowie, Johnny Cash, Tom Waits, Miles Davis, Metallica, Stephen Hawking, Robert De Niro, and The Rolling Stones. 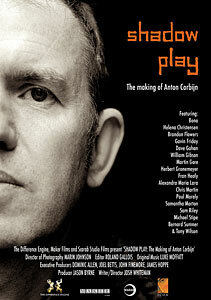 Much of the acclaim in Shadow Play from Corbijn’s subjects centres on his ability to “go to that dark area that most other lensers can’t reach”, or that “he truly captures one’s soul” with his work, to paraphrase their words. Such platitudes get repetitive and overstated if, like me, you feel Corbijn’s still photography work is highly overrated. I’ve seen more than enough of it over the years, especially as a devout U2 fan, and the accolades and critical reinforcement he receives have always eluded me. The common criticism, with which I concur, is a propensity for dark, murky shots that succeed in alienating the viewer as much as captivating them. Flowers talks about this very issue, in an interesting anecdote about his record company’s reluctance to have Corbijn work with the band. Stipe mentions the fact that Metallica employed Corbijn to assist in their image rebranding after a lengthy hiatus (in 1996 to shoot the CD and promotional photos for their Load album). What Stipe fails to mention is that the rebranding was not received well at all by the media and, especially, by their fans. Corbijn’s work, expectedly, gets the bulk of the screen time in Shadow Play; what Whiteman fails to uncover, however, are the layers to him that exist outside of that work. Several interviews with him reveal little about his upbringing and make virtually no mention of his private life. Corbijn isn’t exactly a dynamic interview subject, either. Whiteman also errs in spending so much time focusing on Corbijn’s feature film debut Control (review), a biopic of Joy Division singer Ian Curtis. Control distractingly becomes a running narrative throughout Shadow Play, with seemingly little rhyme or reason as to why we’re getting yet another look at an interview with the cast, behind-the-scenes footage, or coverage of the Cannes film festival premiere, none of which would even stand out as noteworthy DVD extras. If Corbijn’s supposed stock-in-trade is visually getting to the soul of his subjects then this film, ironically, fails to do just that. This entry was posted in Directors, Documentaries, Film Festivals, Hot Docs and tagged #hotdocs10, music, photography. Bookmark the permalink. Wow, you are tough when it comes to handing out stars or perfect scores. Good review but you think Corbijn’s photography is overrated? I strongly disagree. He’s developed a style that is unique which isn’t easy to do. A lot of his work is iconic and deserves praise in my books. I calls ’em as I see ’em. And I stand by my “overrated” comment. You’re a photographer, so I can see having more appreciation for his “unique style”…I just don’t think that style is particularly great.